There are at least two basic ways that we create associations. The first is associations in space. The second is associations in time. Associations in space include recognizing static objects like chairs, trees, cars and people. The reason this works so well is that we live in a world filled with many different kinds of more-or-less fixed objects so that two or more people can agree they have similar attributes. Associations in time include musical tunes and sounds, or associating one thing (cause) with another thing in the future (effect). For many of these dynamic associations like music, two people with normal hearing senses hear the same sequence of notes in time and can agree that what they heard was a portion of a familiar song, which they may independently be able to name if they have heard it before and made the appropriate associations in memory. But your exact associations related to the song will be different than mine because I associate songs with episodes in my life that you do not also share. Remember, the brain tags everything with patterns of associations unique to the individual. The human brain is adept at pattern recognition. It can dissect its sensory information and see patterns in space and time that it can then associate with abstract categories such as a chair or a bird, and even specific sub-categories of these if it has been adequately trained (at school, or by reading a book on ornithology!). An upside-down chair seen in the remote distance is recognized as a chair no matter what its orientation in the visual field. A garbled song heard on an iPhone in a loud concert hall, or a particular conversation between two people in a noisy crowd, can also be detected as a pattern in time and recognized. The figure shows some of the brain connection pathways identified in the Human Connectome Project that help to interpret sensory data as patterns in space and time. Patterns in space let us recognize the many different kinds of objects that fill our world. In the association cortex, once these identifications have been made, they are also sent on to the language centers where they are tagged with words that can be spoken or read. Once this step happens, two individuals can have a meaningful conversation about the world beyond their bodies that the senses can detect. Of course when both people say they have a specific category of objects called Siamese cats, they are most certainly associating that name with slightly different set of events and qualities corresponding to their cat’s personalities , fur patterns, etc.. The next step is even more interesting. Just as the brain generalizes a collection of associations in space to define the concept of ‘cat’, it can detect patterns in time in the outside world and begin to see how one event leads to another as a rule-of-thumb or a law of nature. If I drop a stone off a tall cliff, it will fall downwards to the valley below. If the sun rises and sets today, it will do so again tomorrow. There are many such patterns of events in time that reoccur with such regularity that they form their own category-in-time much as ‘cat’ and ‘chair’ did in the space context. ‘If I visit a waterhole with lots of animals, there is a good chance that tigers or lions may also be present’. More recently, ‘If I stick my finger in an unprotected electrical outlet, I will probably be electrocuted!’. This perception of relationships is one of cause-and-effect. It has been studied by neurophysiologists, and is due to stimulation of part of the cerebellum and the right hippocampus. 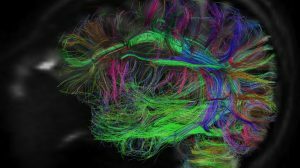 These brain regions are both involved with processing durations in time. Over the centuries and millennia, the patterns in time we have been able to discern about the outside world have become so numerous we have to write them down in books, and also put our children through longer and longer training periods to master them. This also tells us something very basic about our world. Instead of being a random collection of events, our physical world contains a basic collection of rules that follow a ‘logical’ If A happens then B happens pattern in time. Physicists call these relationships ‘laws’ and their particular patterns in time and space can be discerned from measurements and observations made of phenomena in the world outside our brains. The brain can also work with these laws symbolically and logically, not by describing them through the usual language centers of the brain, but through a parallel set of centers that make us adept at mathematical reasoning. In my next blog, I will discuss how mathematics and logic are intertwined and help us think symbolically about our world. Check back here on Friday, December 9 for the next installment!